Foreign to Familiar is a splendidly composed, well-researched work on cultures. Anyone traveling abroad should not leave home without this valuable resource! Sarah's love and sensitivity for people of all nations will touch your heart. This audiobook creates within us a greater appreciation for our extended families around the world and an increased desire to better understand them. Foreign to Familiar has been translated into more than 10 languages. With more than 100,000 sales and growing, it has continued to be used by many international interests, universities, and colleges. 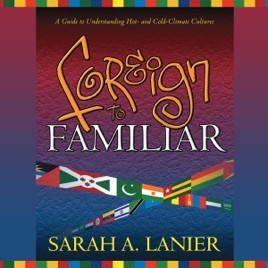 Author Sarah A Lanier travels extensively around the world, leading seminars on the diversity of cultures.